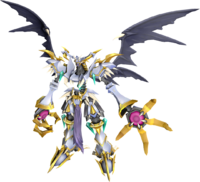 One of the holy "Royal Knights", it possesses the powers of the wyvern. 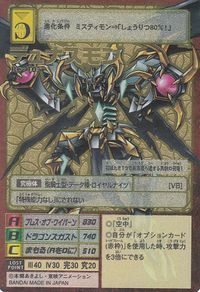 It is a unique being among the Royal Knights, in that it serves the lord who embodied its own sense of justice with deep, unquestioning loyalty. For example, for the sake of its own justice, it won't hate its lord even if they are called "Evil". For that reason, it has a strong spirit of chivalry and bushido, with a character that honors devotion, fidelity, and courtesy. 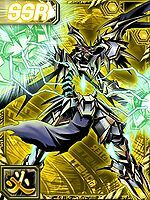 With its tenacious, dragon-like power, and dragon armor made from high-purity Chrome Digizoid, it boasts unparalleled strength. Its Special Moves are firing energy shots from the palms of its hands, with all the attributes of the Ten Warriors (Dragon's Roar), and transforming its body's energy into an aura of a gigantic wyvern (Breath of Wyvern). Although the powers of the wyvern have been drawn out exceptionally, accomplishing its transformation into a baleful figure, its dragon armor is mostly composed of the lightest-weight "Blue Digizoid". Nevertheless, it is because of the excess, tenacious power of the wyvern that makes the large, heavyweight Dynasmon reach high altitudes in an instant with a sweep of its wings. 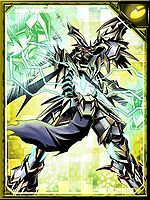 As long as it is for the sake of its lord, it will unleash its "Dragon's Gust", in which it thrusts the gigantic horns on its head, soars, and then charges at the enemy with its body, leading it to being the best and most skillful among the Royal Knights in aerial combat. 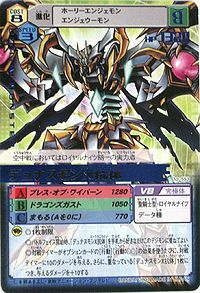 Although it is a member of the holy "Royal Knights", it is a unique being, serving the lord who embodied its own sense of justice with deep, unquestioning loyalty (even if they are called "Evil"). It has a strong spirit of chivalry and bushido, and honors devotion. The powers of the wyvern have been drawn out due to X-Evolution, transforming it into a baleful figure, and acquiring tenacious power at the same time. Special Move: Thrusts the gigantic horns on its head, soars, and then charges at the enemy (Dragon's Gust). | Dynas is short for dynastēs (δυνάστης) (「デュナステース」 Dyunasutēsu), meaning lord. Flies towards the opponent and stabs it with the horns on its head. Creates a giant wyvern out of energy that destroys everything around it in an instant. Fires energy shots from the palms of its hands with all the attributes of the Ten Warriors. 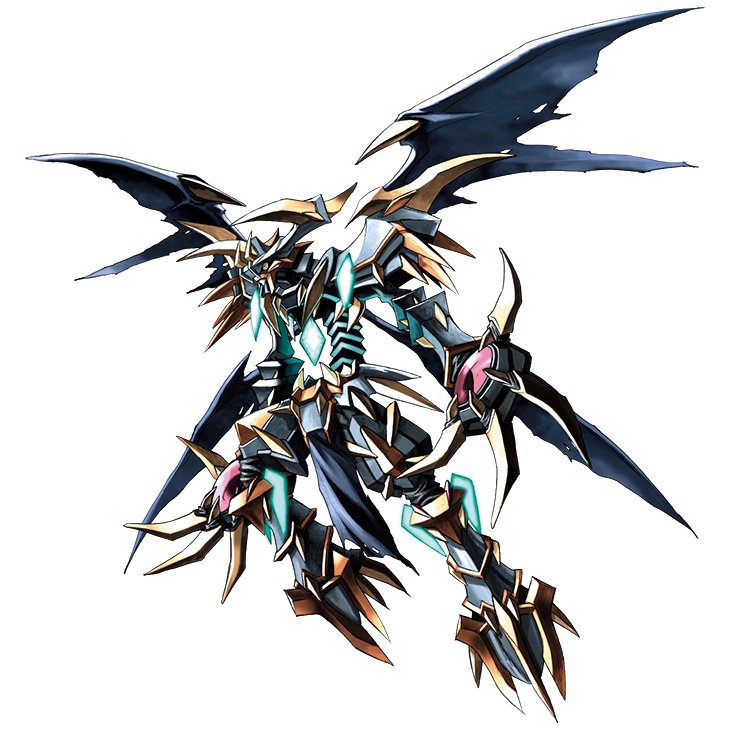 Dynasmon X-Antibody is available as a Digimon Medal. 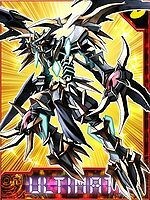 Can be obtained as a Blast Evolution of Metal Fantomon or Metal Piranimon. This loyal wyvern knight enforces its ruthless justice! This unique wyvern reaches towering altitudes with just one flap of its wings! 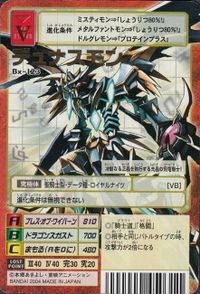 It is the most powerful among the Royal Knights when it comes to aerial battles. This page was last modified on 9 April 2019, at 10:47.